The all new Cactus Juice Clean-Boost / Overdrive pedal features true bypass and seperate pre-gain and volume controls for both functions. This allows you to dial in the perfect clean boost and the perfect overdrive tones and have the volume settings proportionate to the true bypass sound. It delivers the Jimi neck-pickup clean tone and actually has the "feel" of a tube amp. In other words, it will respond to your pick attack. Pick lighter and it cleans up. Lay into it and listen to it scream. 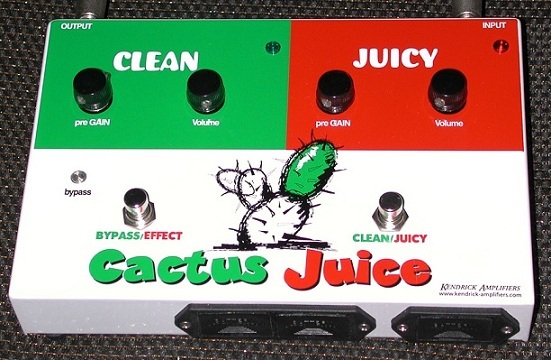 Cactus Juice full length demo from Robert Hansen on Vimeo.